So, Chocolate is the New Health Food? I'm not different from most people because I really like chocolate. As a child, on winter evenings we'd have a cup of Mom's homemade hot chocolate, sometimes even a fresh baked brownie or homemade fudge. We often thought beating the fudge to a cool and glossy stage was a lot of work, but well worth the effort. Baking chocolate chip cookies or making a chocolate cake were familiar tasks and gave me an anticipatory high. These were great treats because we didn't have them very often. As my tastes matured I began to appreciate dark chocolate for its deeper more complex flavor. The strange thing is that all forms of chocolate have had an undeserved reputation as fat builders, tooth decayers, and generally an unhealthy food. Milk chocolate has saturated milk fat in it that may contribute to production of LDL (the bad cholesterol), which leads to plaque in the arteries, causing stroke and coronary heart disease. However, new research reveals that chocolate and cocoa products are actually healthy foods. It's not the chocolate that's the problem, it's the sugar and saturated milk fat that can cause problems. Flavonoids are found in many plants and drinks made from plants, such as chocolate, tea and red wine. In fact they?re responsible for the color of flowers, blueberries, grapes and red wine. 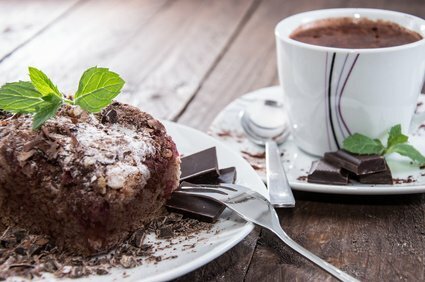 Researchers at the University of California, Davis, observed that regularly eating or drinking chocolate or cocoa products significantly increased antioxidants in the blood. They concluded that moderate amounts of chocolate can help prevent the formation of bad cholesterol, LDL. As a consequence, this may help decrease the risk of stroke or coronary heart disease. Of course, this presupposes that a person is eating an otherwise healthy diet. Silvina B. Lotito, Ph.D. a research associate from the Linus Pauling Institute seems to agree, "Cocoa powder and cocoa-derived products, especially dark chocolate, are good sources of flavonoids, mainly epicatechin and its oligomers, called procyanidins. Dark chocolate has the highest total catechin and procyanidin content." Procyanidins, compounds commonly found in red wine, may promote healhty blood vessels. The procyanidins found in chocolate seem to be effective in antioxidant activity seen in lab experiments. Dr. Lotito reveals, "The latest research suggests that cocoa flavonoids may decrease the oxidation of human plasma compounds (LDL, lipids in general, and physiological plasma antioxidants like vitamin E), modulate platelet activation (an aspirin-like effect), and may positively affect the balance of certain substances involved in hemostatic and inflammatory processes. All these effects of cocoa flavonoids are considered highly relevant to the possible inhibition of atherosclerosis in humans who regularly consume cocoa products." There are more flavonoids in dark chocolate than milk chocolate, which contains the saturated fat from milk. Although the natural fat in cocoa products is a saturated fat, stearic acid, it doesn't seem to cause problems with fats in the blood stream. Ready to try something different? 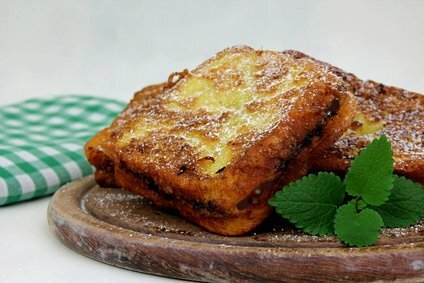 Experiment with French toast made with whole grain bread like Roman Meal. 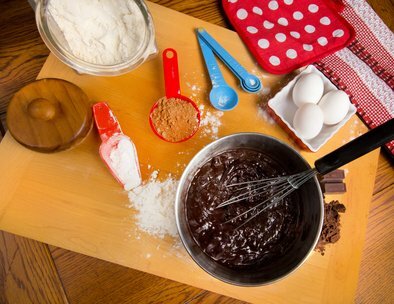 Sprinkle dark chocolate chips liberally between two slices and let the chocolate melt. You won't need syrup. Regular use of chocolate may help prevent some chronic diseases by decreasing inflammation and so many diseases are made worse by inflammation. For people who are don't drink red wine or tea, chocolate is a good antioxidant. Dr. Lotito reminds us, "As is the case with red wine, enjoying chocolate in moderation seems to be the key. The good news is that chocolate is not only a delicious food enjoyed by millions, but is also an appealing source of potentially healthful compounds." So I'm saying, make that cup of hot cocoa and have a brownie, but eat them in moderation and you're still doing something good for your body. So, Chocolate is the New Health Food?, health benefits chocolate, dark chocolate health benefits.